You are currently browsing the tag archive for the ‘TIMSS’ tag. An international study shows that Japanese children are getting better at math and science. The study is conducted every 4 years throughout the world by the Netherlands-based Trends in International Mathematics and Science Study. Last year 8,800 Japanese 4th and 8th graders were a part of about 500,000 students tested in 60 countries and territories. For 4th graders, Japan ranked 5th in math and 4th in science among 50 countries and territories. For 8th grade students, Japan also ranked 5th in math and 4th in science among 42 countries and territories. The average scores of the Japanese students tended to improve. Asian schoolchildren from Singapore, South Korea, Hong Kong and Taiwan dominated the higher ranks. Eight years ago, Japanese schoolchildren showed a clear declining trend in math and science. This prompted the education ministry to revise its policy of promoting pressure-free education, and increased classroom hours and subjects. Schools have introduced scientific experiments and observation methods in order to help children study math and science as it relates to their everyday lives. Ministry officials say these efforts may have contributed to the schoolchildren’s improved performance. Check out the top 10 scoring countries TIMSS study below. Japanese primary and middle school students ranked fourth in science and fifth in mathematics worldwide last year, an improvement from four years before, according to an international survey released Tuesday. The results of the 2011 Trends in International Mathematics and Science Study (TIMSS) were announced by the education ministry. Fourth-year primary school students and second-year middle school students, or eighth graders, scored 558 to 585 on average against the international average of 500. Fourth-graders from 50 countries and territories and eighth graders from 42 nations and regions participated in the survey, conducted by the International Association for the Evaluation of Educational Achievement. Japan’s rankings from the previous survey in 2007 were unchanged except for mathematics for fourth graders and science for eighth-graders, where Japan fell by one place. However, average scores rose by four to 17 points, except for eighth-grade math. The ministry said there was an increase in the number of high-scoring students in Japan, showing signs of improvement in academic ability due to reforms of curriculum and new teaching guidelines. Asian economies performed well in general. 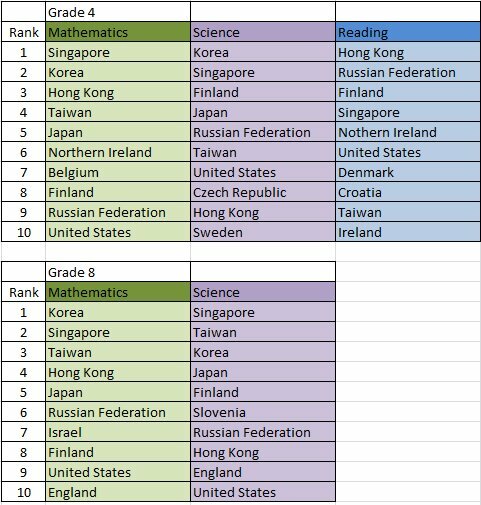 Singapore scored top in fourth-grade mathematics and eighth-grade science, while South Korea led in fourth-grade science and eighth-grade mathematics. In Japan, about 4,400 students each from primary and middle schools participated in the tests in March 2011. The survey found that the number of those who enjoyed studying in Japan was up from the previous survey, while the only category that exceeded the international averages was fourth-grade science. All other categories were three to 27 points lower than international averages. The average score of Japanese elementary school students in global achievement tests in mathematics and science last year showed a marked rise from the previous survey in 2007. The average score for the fourth-graders showed an upward trend for the first time since 1995 in the tests conducted every four years by the International Association for the Evaluation of Educational Achievement. The education ministry on Tuesday attributed the rise to changes in the curriculum guidelines in fiscal 2009 that led to an increase in hours spent on instruction. In the 2011 Trends in International Mathematics and Science Study, or TIMSS, the average score of Japanese fourth-graders stood at 585 points in arithmetic, up 17 points from the 2007 survey, and 559 points in science, up 11 points. The points were calculated based on the TIMSS scale in which the average score of all participants comes to 500 points. In the 2011 test held by the Amsterdam-based organization, the number of participating countries and territories increased to 50 from 36 in 2007 for fourth-graders but declined to 42 from 48 for eighth-graders. The average scores of Japanese students in the second year of junior high school was 570 points in mathematics, unchanged from the 2007 survey, and 558 points in science, up 4 points. The education ministry said it expects the average score for Japanese in this age group, which remained almost unchanged from the 2007 survey, to rise in the next TIMSS in 2015 after new curriculum guidelines take root. Among the 50 countries and regions, Japanese fourth-graders ranked fifth in arithmetic, down from fourth in 2007, and fourth in science, unchanged from the last test. The junior high students finished fifth in math, unchanged from the last survey, and fourth in science, down from third. Singapore occupied the top spots in arithmetic for fourth-graders and science for eighth-graders, while South Korea came out on top in science for fourth-grade students and math for eighth-grade students. In the 2011 survey, Japanese fourth-graders who said studying science is fun accounted for 90 percent, up from 87 percent in the previous test and above the international average of 88 percent. But enthusiasm for studying science was below the global average among Japanese second-year junior high students. The fourth-graders interest in arithmetic was also below the world average.